Cal here. It’s Tuesday Stretch and my birthday is just a couple days away. Since I’m traveling next weekend, Jeff planned my birthday celebration for this past weekend. Much to my delight, it included a visit by my older son, his wife and our 17 month old Grandson, Everett. This was his first “walking” visit. We walked around and looked at the Stretch Glass several times and he also inspected the Fenton glass and Early American Pressed Glass. He was fascinated by all the colors of the glassware in the house. The carnival glass is all up on top of a tall cabinet, so it will be a little while until he notices it but when he does, we will either take the glass down or take him up to the glass so he can begin to learn about it. Jeff chose to use stretch glass on the table where the hors d'oeuvres and sweets were served. Here is a pic of the flowers and center piece bowl (Persian Pearl) filled with gourds. 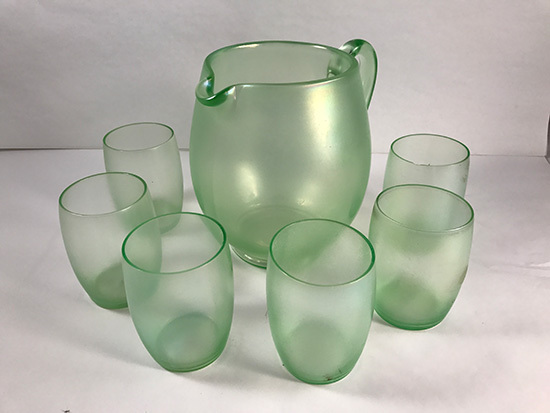 He surprised me with 4 Fenton Florentine Green stretch glass ‘barrel’ tumblers which completes another stretch glass water set. 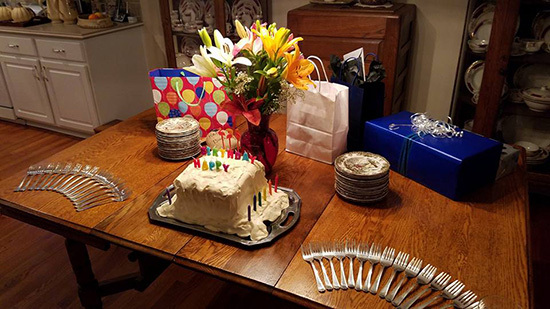 He also gave me a few other pieces of stretch glass and threw a great party for me, complete with his very moist and delicious homemade carrot birthday cake! 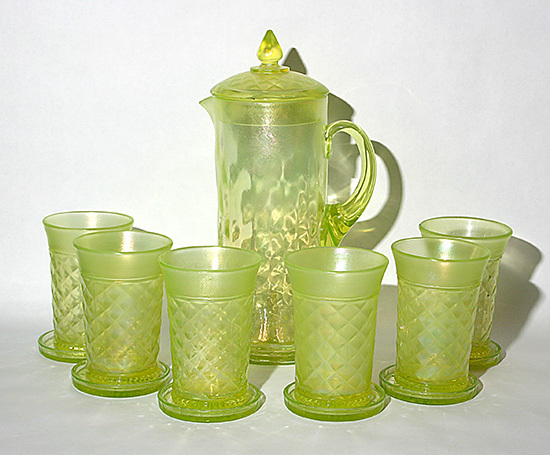 Since I’m celebrating the completion of a water set – probably better referred to as a ‘beverage set’ because some of these sets were sold as lemonade, iced tea and juice sets as well, I thought I’d share a few other beverage sets with you to highlight the different styles made by various companies. Let’s continue with the Adam’s Rib set by Diamond Glass-Ware Company. 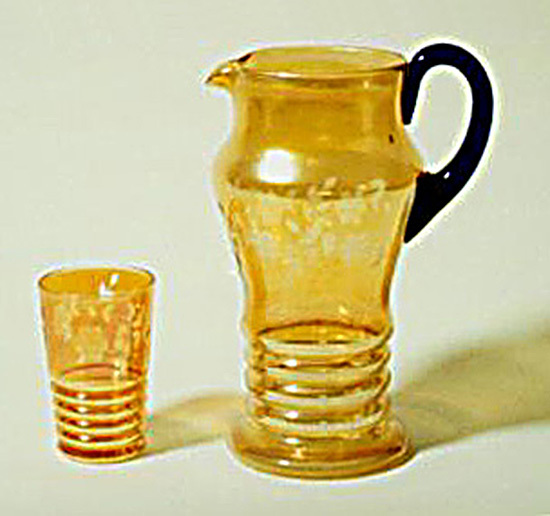 As was common, the pitcher and the similar vase were made from the same mould. The pitchers are scarce and as far as I know, are only known in blue stretch. A complete set would have 6 handled tumblers (or mugs, if you prefer) but the pic I have only has 4. 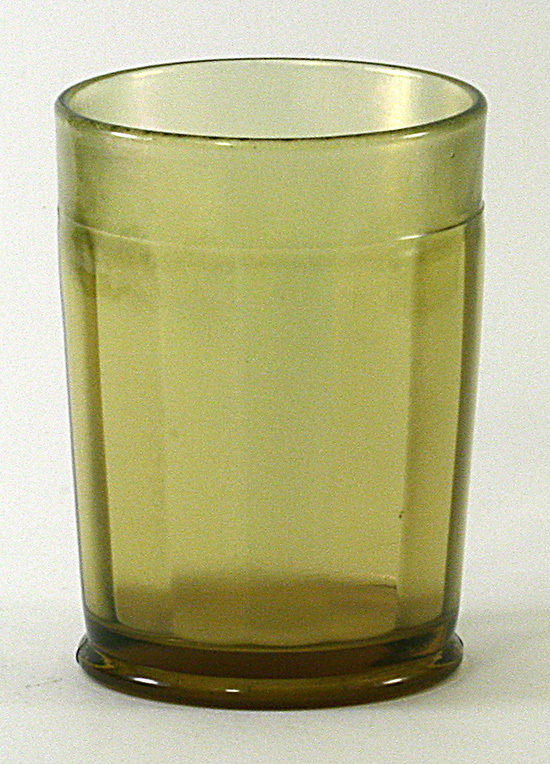 The handled tumblers were sometimes sold as souvenirs with gold script lettering on them. If you have another color, please let us know and share a pic of it. 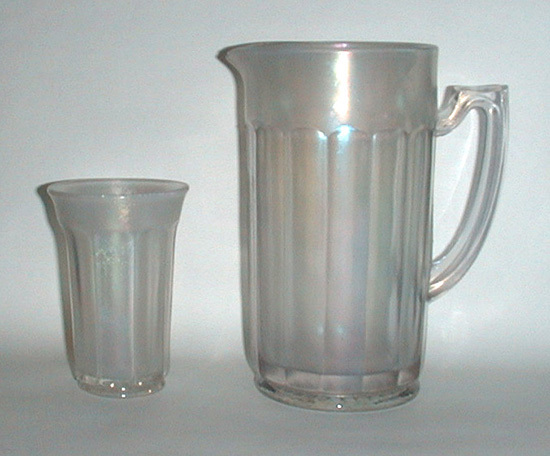 Diamond made other Pitcher and Tumbler sets. 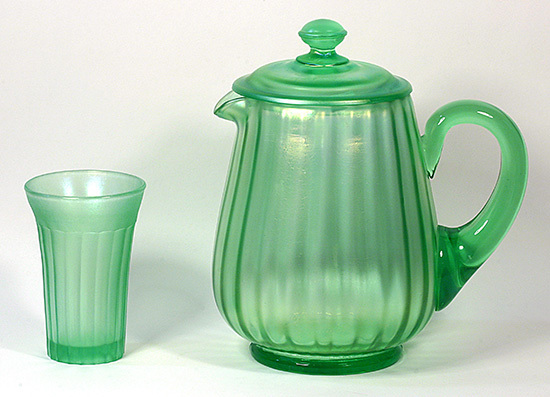 One pitcher has optic ribs and the tumblers have moulded ‘ribs’ which are really more like vertical panels. The pitcher should have a cover. This set is known in blue and green. 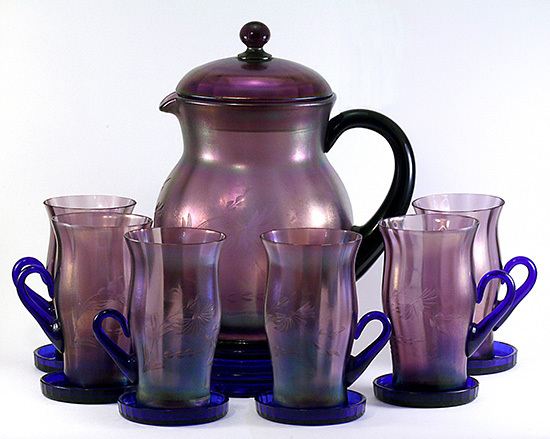 Fenton made lots of Pitcher and Tumbler sets. Some are fairly common and others are quite scarce. Since the curtain and rib optic ones were just discussed by Russell, I’ll skip them. Here are a few of the others. There are matching uniridized coasters available in crystal, cobalt blue, Celeste blue, Velva Rose and Topaz. Imperial gave us “Chesterfield” Pitchers, Tumblers and Mugs. 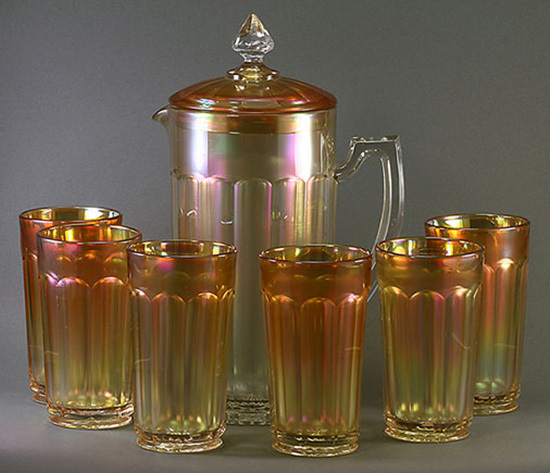 I am fortunate to have a pitcher and 6 tumblers in Iris Ice as well as a pitcher, cover and 6 tumblers in Marigold carnival glass. A very nice set in Diamond Optic was made by Northwood and comes with matching coasters. These sets are available in Blue and scarce in Topaz. Here is my Topaz set complete with the black base for the pitcher and Northwood topaz coasters. 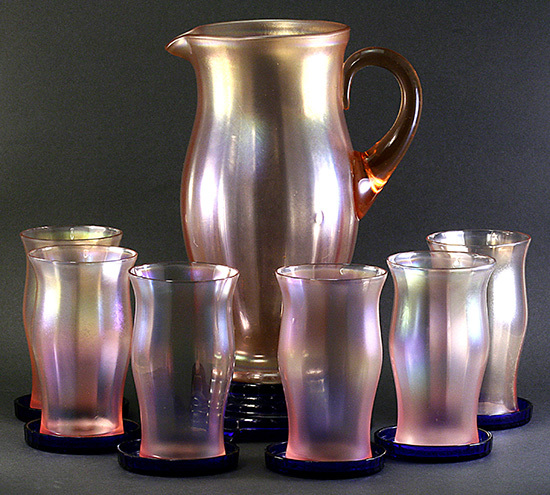 Northwood also made a pitcher and tumblers in “Barbella. 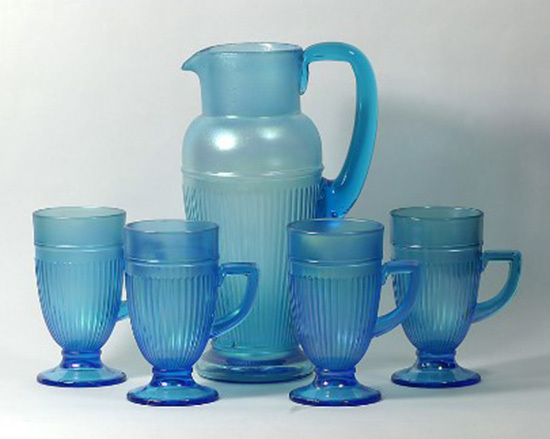 My experience is that the tumblers are scarce – I’ve seen a few topaz ones in auctions and own a single Russet one. 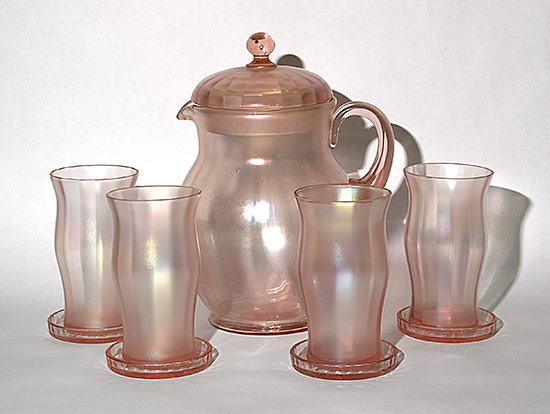 The pitchers are rare – I’ve heard of a complete topaz “Barbella” water set but I’ve never seen it. If you have it, I’m sure everyone would love to see a picture of it. 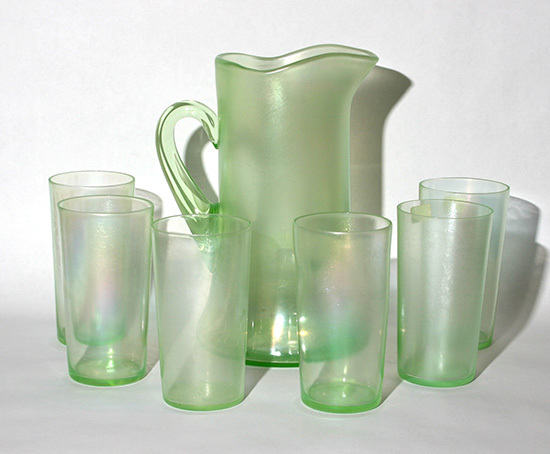 There you have it, the reader’s digest version of stretch glass pitchers and tumblers. Please share info and pictures of your pitchers and tumblers. Thanks.